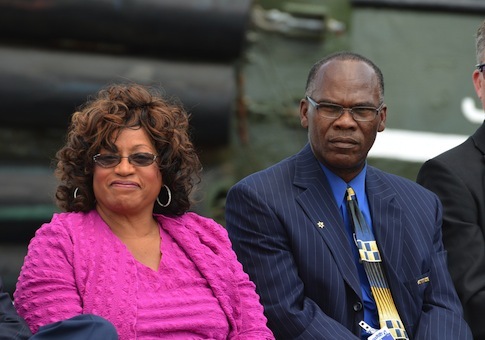 A nonprofit connected to Rep. Corrine Brown (D., Fla.) and run by a local political power player overbilled Medicaid by nearly $1.4 million, the Florida Times-Union reported. According to an audit by the Florida Agency for Health Care Administration, the Community Rehabilitation Center in Jacksonville overbilled Medicaid by nearly $1.4 million. Reggie Gaffney, a former Jacksonville Port Authority board member, runs the nonprofit, which provides medical services for mental illness, substance abuse, and HIV/AIDS for low-income residents. Brown’s daughter, Shantrel, is a lobbyist for Arlington-based Alcade and Fay, whose clients include the nonprofit. Community Rehabilitation Center has paid $185,000 to Alcalde and Fay since 2005. Such arrangements aren’t unusual in Congress. According to a 2012 report by government watchdog group Citizens for Responsibility and Ethics in Washington, 44 members have family members who lobby or are employed in government affairs. Brown requested nearly $3 million in earmarks for the Community Rehabilitation Center between 2008 and 2010, when Congress banned earmarks, the Florida Times-Union reported in 2010. Of those requests, Congress approved $147,000. However, the tax dollars did not go directly to the nonprofit health center, but rather "streetscape improvements and renovation" for Pearl Plaza, the shopping center in Jacksonville where the nonprofit is located. Gaffney and several other Community Rehabilitation Center executives own three for-profit businesses that lease space in the plaza. Gaffney and the health center did not immediately return request for comment, but in 2010 he said that the for-profit businesses provided job training. When the connection between Gaffney, Brown, and her daughter was revealed by the Florida Times-Union in 2010, Gaffney said he was "unaware of Ms. Shantrel Brown's involvement with securing funding for the agency." Gaffney has contributed $5,300 to Brown since 2003. Brown’s office did not return requests for comment. "It is most unfortunate that there always seems to be a negative connotation concerning member earmarks," Brown wrote in 2010. The money "will be utilized to renovate the Pearl Street Plaza to allow it to house additional businesses, including vocational rehabilitation programs." Authorities seized a house in April used by the Community Rehabilitation Center for its veteran program. The house—donated by the group Allied Veterans of the World—was seized after a judge ruled it was purchased by Allied with illicit proceeds from illegal gaming centers. Allied is accused of housing illegal gambling stations in storefront cafes, raking in more than $300 million over six years. Gaffney said he had no idea illicit funds were used to purchase the house. Rep. Brown was present at the ribbon-cutting ceremony for the house. Brown and her daughter have both faced ethical questions in the past. Brown's campaign committee paid her daughter's husband, Tyree Fields, $5,500 for political consulting work in 2006. A congressional ethics committee investigated Brown in 1999 after a $50,000 Lexus purchased by African banker Karim Pouye was registered to Shantrel Brown. Brown failed to disclose a $10,000 donation from a secret Wisconsin bank account that her friend Baptist leader Henry J. Lyons allegedly used for money laundering during her 1996 re-election campaign. The House Ethics Committee eventually cleared Brown. Brown paid a $5,000 fine to the Florida Ethics Commission in 1993 after it found she used legislative staff members as employees in a travel agency she owned. In another instance, Brown’s campaign treasurer quit after discovering his name had been forged on campaign reports, leading to a rebuke from the Federal Elections Commission. This entry was posted in National Security and tagged Congress. Bookmark the permalink.